After 25 years Atrocity are still able to surprise their fans and critics. This time they hooked up with Yasmin Krull and so it's obviously not a typical Atrocity album. Some might remember Calling The Rain?! If you know that EP, then you have an idea what to expect. 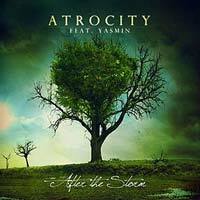 With After The Storm Atrocity get back showing Atrocity different with ethnic sounds and female vocals. Dark and symphonic After The Storm opens up with A New Arrival. A melancholy ethnic rock / metal track. They speed up for Call Of Yesteryear which offers Oriental sounds and cites Indian music. Singer Alex Krull joins Yasmin and his dark, clean vocals work well with Yasmin's voice. One of the highlights is Silvan Spirit, a folk tune which will enchant you. Metal fans will love Black Mountain which is a fast, heavy tune which also shows some Atrocity sound elements. The Krulls seem to come from different musical genres, but together they can create something unique. Atrocity find a good balance between atmospheric ethno tunes and ethno metal tunes. The atmospheric ethno tunes partly have a metal touch, but most songs are based in ethno rock and so metal heads might find it too soft. So, if you never got into Calling The Rain, then check out some tracks and make up your mind. Everybody who loved Calling The Rain and is into ethno rock / metal will discover a great piece of music! If there is a German band which can be called innovative, then it's Atrocity. Even in the 80's they tried to develop, to cross boarders. And don't think that you know Atrocity, coz you know one of their albums. You never know what to expect. They sing German and English. They write their own songs and also do cover versions of cult songs and add their very own style. In 1997 they released Werk 80 which was their reminiscence to the cult songs of the 80's. It was a collection of the most famous and known pop songs of the 80's and with the Atrocity-like guitars as well as rock and metal elements they created something unique. Afterwards they released a Best-of album. Now they present Gemini. One way to show the two sides of Gemini is that they release two different versions of the album. Both discs have 11 songs, one version (red cover) finishes with a cover version of Lili Marleen in English, while the blue covered CD has the German version. After comparing the two versions, I can't say this one is better then that one, both are really interesting. A highlight on Gemini is without any doubts the cover version of the Simon & Garfunkel songs Sound Of Silence which is sung by Atrocity singer Alex Krull who is joined by the lovely Liv Kristine Espenaes (singer of Theatre Of Tragedy). The final touch the album got at Mastersound Studio where the band worked again. They are known for their partly highly discussed interpretations of classical tracks, but still stick to their roots and always it's obvious that Atrocity are the ones who play it. I guess that again critics will argue and there will be people who won't be satisfied, but at all Atrocity did a decent job. Especially the opening track which will also be the first single Taste Of Sin sounds good and catchy. I think that track will soon be heard in every independent discotheque and the dance floor will be packed!